Marshall Crenshaw is a triple threat -- a great songwriter, an impassioned rock'n'roll singer, and a formidable guitarist. He writes songs that seem effortlessly melodic, but theyre the kind of tunes that can come only from hard work and craftsmanship. His eponymous first LP, released in 1982, was universally acclaimed, and for good reason. Crenshaw, whos always shown a deep appreciation for the history of songwriting, absorbed every great pop influence of the previous 30 years and synthesized them to create something new. When I asked him which songwriters influenced him the most, Crenshaw named Brian Wilson, Thom Bell, and Burt Bacharach. "I guess Burt was a big influence on the other two," he said. "Anyway, the chord changes in their songs always grabbed me in an emotional way. I still love what they did and have just absorbed it." Crenshaws songs sound fresh, despite being solidly based on traditional rock. His records have been remarkably consistent during the last 28 years, though tin-eared critics felt his 80s LPs for Warner Brothers fell short of the standards set by his debut. Still, "Whenever Youre on My Mind" (from Field Day, 1983) "The Distance Between" (from Downtown, 1984), "Calling Out for Love (at Crying Time)" (from Mary Jean & 9 Others, 1987), and many others were memorable and radio friendly. A few critics, such as Robert Christgau, have been supportive over the years and others have since come to reappraise Crenshaws Warner Brothers albums. In 1991 Crenshaw moved to MCA/Paradox, and he later switched to Razor & Tie, where he remained until 2003, releasing consistently well-written and well-received songs. Jaggedland (FTN 17771) is Crenshaws tenth studio album and his first for Santa Monicas indie 429 Records. A dark undercurrent runs through some of the songs, such as "Stormy River" ("Your eyes are brown like a stormy river / Your words they twist like a stormy river") and "Eventually" (Watching headline news / Sociopaths and fools on parade"). As a result, Jaggedland contains some of Crenshaws richest and most emotionally absorbing lyrics. "I set out to write the best songs I could write, and to make sure that I felt and believed everything I was saying," he said. The songs are also musically rich, as with the juxtaposition of major- and minor-scale lines in "Right on Time." Crenshaw clearly hasnt lost his ability to create melodies that linger in your mind and pull you in. He also doesnt seem to have lost any of his vocal range. Some seem to think that Crenshaws singing, which is similar to Paul McCartneys in its ease and clear phrasing, lacks effort or emotion. Elvis Costello, whose songwriting skills and influences are in some ways similar to those of Crenshaw, has a powerful and expressive voice, though he isnt as pure a singer. But Crenshaw sings with great feeling, and either the years have been kind or hes taken great care of his voice, because he hits high notes as easily as he did 28 years ago. His singing and his rich vocal harmonies, along with his love of a wide range of pop music (when I saw him live in 1991, he covered Molly Hatchets "Flirtin with Disaster"), make his records memorable and enjoyable. I saw Crenshaw perform in late January. He accompanied himself on guitar, and his command of the instrument amazed me. His chord changes have more in common with jazz than rock, and he even studied jazz guitar at one point. "I took a few lessons from Sal Salvador in New York back in 86, then a few more from Peter Einhorn in Woodstock a few years later, just trying to fill in some gaps in what I was able to figure out on my own," he said. But despite his ability, he doesnt show off. He instead uses his skills to strengthen his songwriting. "I just think that knowledge is power," he said of the influence formal study has had on his work. 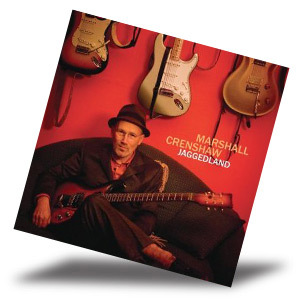 Crenshaw has the chops of a bona fide rock guitar hero, and Jaggedland contains many examples of his talents as a soloist. Hes an impressive player, but his beautifully constructed solos are always grounded in the songs melody. "Right on Time" features a flurry of blinding notes and fast pull-offs followed by a series of double-tracked guitar lines, with a 12 string in the left channel and a six string in the right, that bring the solo to a logical conclusion. "Someone Told Me" is built on a series of dark, funky guitar riffs that John Fogerty would be proud of, and Crenshaw fires off a rockabilly solo a la Cliff Gallup, Gene Vincents great guitar player. On "Stormy River," a hard-edged rocker, Crenshaw and Wayne Kramer of the MC5 trade licks and let the sparks fly. Two ballads, "Passing Through" and "Never Coming Down," demonstrate Crenshaws considerable gifts as a ballad writer, as theyre sincere and moving without ever descending into sentimentality. Other songs on the disc, such as the oddball "Gasoline Baby" and the title track, help vary Jaggedlands mood and pace. "Jaggedland" is a pleasant instrumental interlude, enriched by a reassuring Mellotron and a warm, subtle string arrangement by Rob Morseberger, who also arranged the strings on the medium-tempo "Sunday Blues." Crenshaws great ear for arrangements and his use of instruments not often heard in rock, like the upright bass and the vibraphone, make Jaggedland an enjoyable sonic experience. And though the credits list six studios, the disc maintains a consistent, coherent sound. At least part of the credit for the discs sound goes to Jerry Boys, who mixed and co-mastered the album. He also co-produced Jaggedland and engineered a number of its tracks. "I love the recording process," Crenshaw said, "and Im totally engaged when Im making a record. My last few records (on Razor & Tie) were all at least half home-studio efforts. Some good people like Greg Calbi, Brad Jones, and Gene Holder got involved, but I engineered a lot of the stuff myself. I just work on instinct, and sometimes its hit and miss. But on this record I sought out one of the best recording engineers on the planet, Jerry Boys, and left the sonic picture entirely in his hands. He started at Abbey Road and Olympic in the 60s and has literally done it all." Jaggedland features an impressive lineup of musicians, including drummer Jim Keltner. "At some point I decided that I wanted to play this stuff with [him]. Like every other musician I know, I just think hes ridiculously good. I go back quite a few years with the great [steel guitarist] Greg Leisz. He was the second person I asked to join the band, and he recommended Sebastian Steinberg on bass. I wanted a vibraphone player, and everybody I asked mentioned only one person: Emil Richards. We played everything live, and it was just such a blast. Having said all that though, I have to mention that while 80 percent of the record was done in L.A., four of the tracks include great New York musicians like Diego Voglino on drums, Jason Crigler on guitar -- people Ive worked with a lot over the last few years." Ultimately, the songs are what make Jaggedland click. You can hear echoes of Buddy Holly and the Beatles, the British Invasion, and swampland funk, and it all hangs together because of Crenshaws skills and his musical imagination. Steve Van Zandt, Bruce Springsteens guitarist and the host of Little Stevens Underground Garage, wrote a terrific piece a few years ago about the state of rocknroll. "Songwriting is pretty much a lost art," he wrote, "but if new bands study the '60s (as every band in any genre should do) and compare their stuff to the 20 or 30 great garage classics, something good is bound to happen." Marshall Crenshaw is from roughly the same generation as Van Zandt, and he studied the same records. A new generation of songwriters should add him to their course of study.